True love “smote” Richard Polirer in Jerusalem during the Summer of 1973, when he met a girl from – all places – the Bronx. Rabbi Polirer has been married to his Basherte (a wonderful Yiddish term, meaning “destiny”), Suzanne, since that fateful snowy Christmas Eve 1974. Together, they are the proud parents of Jonathan (married to Esther), Eric, Meredith (married to Robert), and Daniel, and are Saba and Savta (grandparents) to little Avi, Lexi, Micah, and Matthew. Like all good Orthodox boys from Brooklyn in the Flower-Power Era, Rabbi Polirer figured that he would hang his Semicha (ordination certificate) on the wall and enter some secular business-world pursuit. Specifically, he had already earned his Master’s Degree in History from Hofstra University (1974), and he figured he would either teach in a college or open a history store of some kind. Ha! Life is what happens on the way to your best-laid plans. The Polirers moved to Fayetteville, North Carolina on New Year’s Day 1978 to assume the pulpit of Beth Israel Congregation. In the grand tradition of the American Rabbinate, they decided to “move on up” to a larger congregation two years later, moving to Temple Israel, in Manchester, New Hampshire. They fell in love with the Granite State and stayed there for the next 17 years. Only when their folks (the sainted in-laws and out-laws) moved to Florida full-time and blatantly refused any longer to freeze during their annual summer visits to NH did the Polirer clan decide to leave the frozen arctic for warmer climes. They invaded South Florida in 1996. 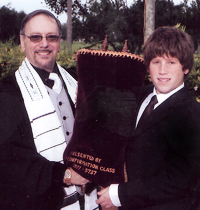 Over the years, Rabbi Polirer has served congregations in Broward and Palm Beach Counties. He also holds chaplaincies at various Independent and Assisted Living Communities across Palm Beach County, officiating at Friday Shabbat Services for the Residents.